In earlier versions of Greek Mythology, Harpies were described as beautiful winged maidens. Later they became winged monsters with the face of an ugly old woman with crooked, sharp talons. They are often referred to as the three daughters of the Giant Thaumas and the Okeanid nymph Elektra. The Harpies were employed by the gods to punish crime on the Earth. Their names were Aello ("the Stormswift"), Celaeno ("the Dark") and Ocypete ("the Swiftwing"). The Harpies were probably the personification of storm winds. They were represented carrying off persons to the underworld and inflicting punishment or tormenting them. Those persons were never seen again. They were sent by the gods to torment a certain Phineus, whom Jupiter had deprived of his sight, in punishment of his cruelty; and whenever a meal was placed before him the Harpies darted down from the air and carried it off. They were driven away from Phineus by the heroes of the Argonautic expedition, and took refuge in the island where Eneas now found them. They robbed the food from Phineus, but were driven away by Cailas and Zetes, the Boreads. In Greek mythology, the Harpies (snatchers) were mainly winged death-spirits best known for constantly stealing all food from Phineas. The Harpy could also bring life. A Harpy was the mother by the West Wind Zephyros of the horses of Achilles (Iliad xvi. 160). Though Hesiod calls them two "lovely-haired" creatures, Harpies as beautiful winged bird-women are a late development, in parallel with the transformation of the "Siren, a creature malign though seductive in Homer, but gradually softened by the Athenian imagination into a sorrowful death angel". On a vase in the Berlin Museum, a harpy has a small figure of a hero in each claw, but her head is recognizably a Gorgon, with goggling eyes, protruding tongue and fangs. The Harpies were sisters of Iris, daughters of Electra and Thaumas. Phineas, a king of Thrace, had the gift of prophesy. Zeus, angry that Phineas revealed too much, punished him by putting him on an island with a buffet of food which he could never eat. The Harpies always arrived and stole the food out of his hands right before he could satisfy his hunger, and befouled the remains. This continued until the arrival of Jason and the Argonauts. The Boreads, sons of Boreas, the North Wind, who also could fly, succeeded in driving the Harpies away but did not kill them, as a request from Iris, who promised that Phineas would not be bothered by the Harpies again, and "the dogs of great Zeus" returned to their "cave in Minoan Crete". Thankful for their help, Phineas told the Argonauts how to pass the Symplegades. In this form they were agents of punishment who abducted people and tortured them on their way to Tartarus. They were vicious, cruel and violent. They lived on Strophades. They were usually seen as the personifications of the destructive nature of wind. The Harpies in this tradition, now thought of as three sisters instead of the original two, were: Aello ("storm swift"), Celaeno ("the dark") - also known as Podarge ("fleet-foot") - and Ocypete ("the swift wing"). Aeneas encountered Harpies on the Strophades as they repeatedly made off with the feast the Trojans were setting. Celaeno cursed them, saying the Trojans will be so hungry they will eat their tables before they reach the end of their journey. The Trojans fled in fear. 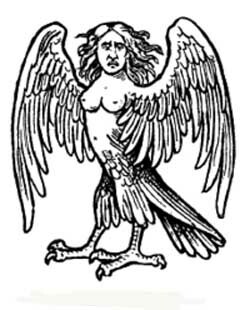 In the Middle Ages, the harpy, often called the "virgin eagle", became a popular charge in heraldry, particularly in East Frisia, seen on, among others, the coats-of-arms of Reitburg, Liechtenstein, and the Cirksenas.